Virat Kohli - The Best Ever? A few days ago, on one of my many Whatsapp groups for cricket, I was involved in quite a discussion regarding Virat Kohli. It started off with whether Kohli was worthy of the ICC Award for ODI Cricketer of the Year, and then moved to his press conference at the conclusion of the second test against South Africa. Some felt that Kohli had lost his cool and should not behaved the way he did. While others, including me, felt that the journalist was needlessly poking him and Kohli did nothing wrong. Amidst all the discussion, I passed a statement (in context) about Kohli being the best batsman in the world at the moment. One friend said it was debatable, to which I replied that among the current crop, he is far ahead of the likes of Steve Smith, Joe Root, and Kane Williamson and what is debatable is whether Kohli is the best ever batsman or not. In my mind, there is absolutely no doubt that Virat Kohli is the best batsman in the world at the moment. The one fact that I always state to support that statement is that he is the only batsman in the world who averages above 50 in every format of the game. There is no other batsman in the world, past or present, who has managed that. Among the current crop of leading batsmen that play all three formats, only Joe Root and AB De Villiers average above fifty in two formats. The 'Index' shown in the above table is an average that has been determined by assigning a weight of 50% to the test average, 40% to the ODI average, and 10% to the T20 average. This Index shows that Kohli is well ahead of the rest of the world. Undoubtedly, Steve Smith has a remarkable test average is arguably the better Test batsman; however when it comes to adapting your game across formats, Kohli is the absolute champion. The biggest criticism of batsmen from the Subcontinent is that they have inflated averaged because they score in batsmen friendly conditions at home and fail when batting in foreign conditions. Strangely enough that argument is never used for batsmen from Australia and England when they pile on the runs at home and fail miserably in the Subcontinent. Well, the table below will highlight that Virat Kohli is just as good in the Subcontinent as he is outside of it. If anything, the table above shows that the Australian Pair - Smith and Warner - perform exceptionally at home and in similar conditions; however their average drops significantly in the subcontinent. The South Africans are a strange anomaly as both AB and Amla average more in the subcontinent than they do outside of it. Williamson and Root have the least difference between their averages in the two conditions. The fact that impresses me most about Virat Kohli is his ability to score international hundreds. Whether it is an ODI or a Test, whether his team is batting first or chasing, whether the match is played in home conditions or foreign, Kohli scores an international hundred on an average every 5.7 innings! That is remarkable considering that no other batsman with at least 40 international centuries scores a hundred as frequently as every 6th inning. Kohli has scored 53 international centuries. In ODIs, with 32 centuries, he is behind only Sachin Tendulkar. In tests he has a long way to go; however his combined tally is right up there with the best the world has ever seen. 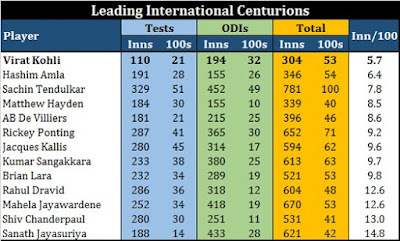 Only Tendulkar, Ponting, Sangakkara, Kallis, and Amla have more international centuries than Kohli does. All of them have also batted in significantly more innings than Kohli has. Barring Tendulkar, Kohli will surpass all of them in the next 3-4 years. He has scored test centuries against all 7 opposition that he has faced. He has not played tests against Pakistan and Zimbabwe. Out of his 21 test hundreds, 10 have been scored in India and 11 outside India. He has scored ODI centuries against all 9 test playing nations. Out of his 32 ODI hundreds, 14 were scored in India and 18 outside India. This is his most remarkable feat. His ability to score hundreds frequently against all opposition and in all sorts of conditions. There is absolutely no doubt in my mind that Virat Kohli is the best batsman in the world currently and perhaps also the best ever to play cricket. Arguably, Virat Kohli if not the best then one of the best ever. And probably the best of last decade. Wanna know more about Kohli? ?